Visit to Frisky Beaver winery for Canada’s 150th Birthday. We had the opportunity to visit this incredible region and experience a few of the many spectacular wineries, alas only one can be featured here today. In honour of Canada’s 150 birthday, our pick is Nk’Mip Cellars, the first Aboriginal owned and operated winery in North America producing stunning award-winning BCVQA wines. Voted as Canadian Winery of the Year 2016 by Intervin, there is so much to be said of Nk’Mip, pronounced IN-KA-MEEP, meaning ‘bottomland’ in English. From the history and the heritage and passion of the owner/operators the Osoyoos Indian Band, to the spectacular setting, the patio restaurant, the Aboriginal inspired farm to table dishes, the view and the wines! Simply glorious! Nk’Mip Cellars is located in Osoyoos, the hottest and driest part of Canada, in fact Canada’s only pocket desert, just a few kilometres north of the Washington border. A site to behold, the winery is nestled in the vineyards and surrounded by time-weathered mountains, with more vines gently sloping down to the lake. 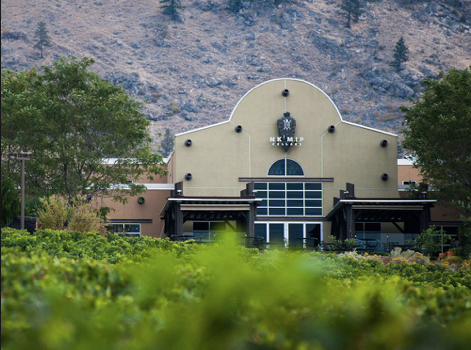 The OSOYOOS Indian Band (OIB), led by Chief Clarence Louie has more than 1,300 acres under vines in the Okanagan, including the Inkameep Vineyard (300 acres) and Nk’Mip Cellars Vineyards (21 acres), with some vines dating back to 1968. The vines are managed collaboratively as part of the partnership between Nk’Mip Cellars and Constellation Brands Canada. Wines are produced under the direction of Senior Winemaker, Randy Picton and Assistant Winemaker, Osoyoos Indian Band member Justin Hall. Nk’Mip Cellars was designed as a small winery with the intention to focus on small quantities of high quality wines. 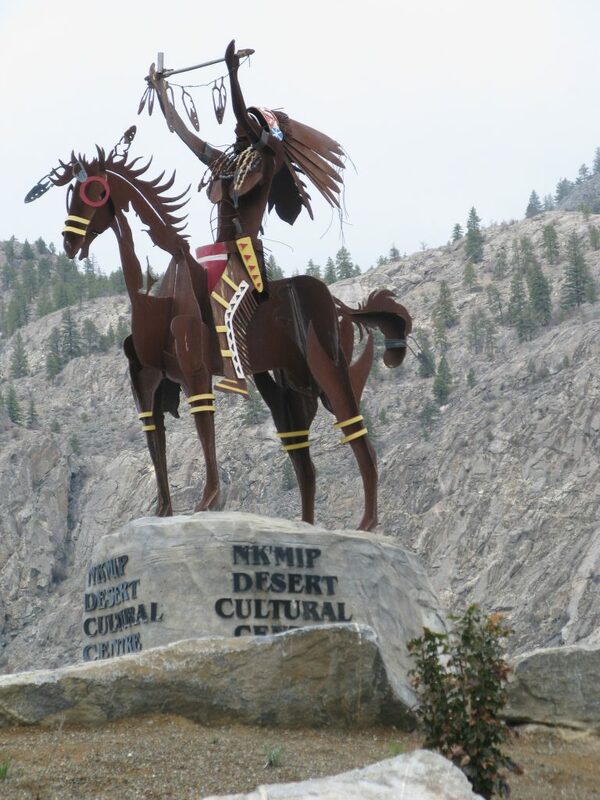 Statue greets visitors at Nk’Mip Cellars, Osoyoos, B.C. Statue greets visitors at Nk'Mip Cellars, Osoyoos, B.C. 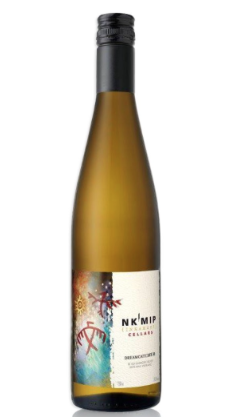 Dreamcatcher 2016 Nk’Mip Cellars Dreamcatcher 2016 is a vibrant and luscious blend of five grape varietals, Riesling, Sauvignon Blanc, Ehrenfelser, Pinot Blanc and Chardonnay, It is an off dry white wine, aromatic with notes of pear and stone fruit on the nose and on the palate. Dreamcatcher is named to honour the native folklore of the Aboriginal cultures and language that guides Nk’Mip. 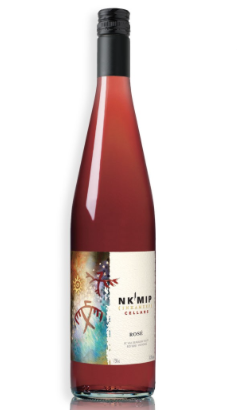 Nk'Mip Cellars ROSÉ 2016.Gone are the sweeter roses of earlier days, dry, crisp and delish, rosés are hot, so think and drink pink today and all summer long! This rosé, a multiple award winner is a blend of Merlot, Pinot Noir, Malbec, Cabernet Franc and Syrah, almost light red in colour, a refreshing rosé with enticing notes of strawberries and slight citrus on the nose and on the palate. 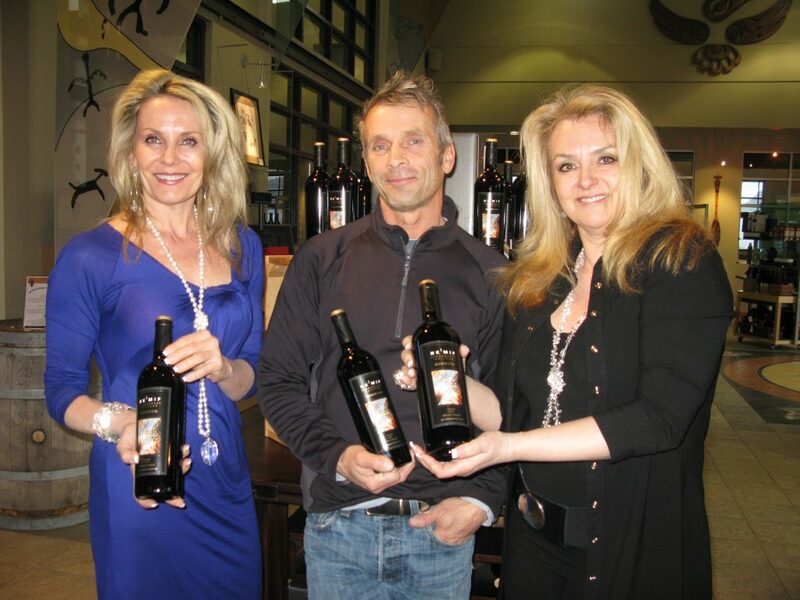 SALUT: First Nation winemakers, Nk'mip Cellars a real B.C. success story. When one thinks of a quintessentially sourced food of BC, sockeye salmon immediately comes to mind! It also happens to play an important role in the First Nations’ culture. 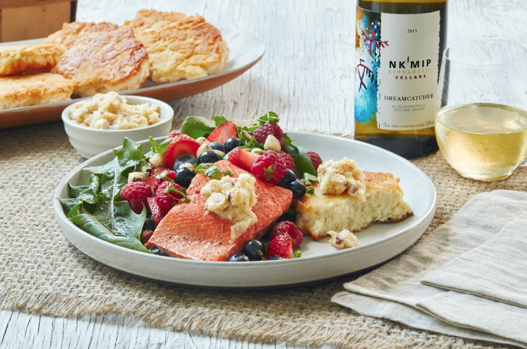 Here’s what the Chef at NK’MIP has to say about a perfect pairing for our featured wine “The alluring blend of Dreamcatcher pairs beautifully to fresh, local seafood which is plentiful come summertime in the Okanagan. Heading back east now over to Ontario and this province’s stunning wine regions, it is comprised of over 15,000 acres of spectacular vineyards. Ontario also boasts being home to over 150 wineries from smaller boutique wineries, to elegant Chateau and ultra modern. With all of this to choose from, where does one begin? We too are blessed here in Ontario with our three official wine regions and many sub appellations all being unique in geography, allowing for a wide array of styles of wine. Our Niagara Peninsula is home to close to two-thirds of all Ontario VQA wines, is well known and respected around the world. Our most southerly vineyards lie in the Lake Erie North Shore appellation, Canada’s most southern reach where the grapes enjoy the greatest sunshine and produce excellent wines too! Prince Edward County, Ontario’s newest wine region located two and half hours from Toronto, on the other side of the lake from Niagara-on-the-Lake, is yet another oasis for fine wine and great food! And the buck doesn’t stop here…or we should say the vineyards! Pioneering winemakers are busy discovering new wine regions within the province with differing local terroir very much suited to grape growing. Our Ontario winery of choice today comes from one such region, aiming to become Ontario’s next VQA appellation Norfolk County! Once the tobacco belt, no longer, wine grapes are staking a claim! Today up to nine wineries in the county have recognized that tobacco and grapes actually enjoy similar growing conditions. 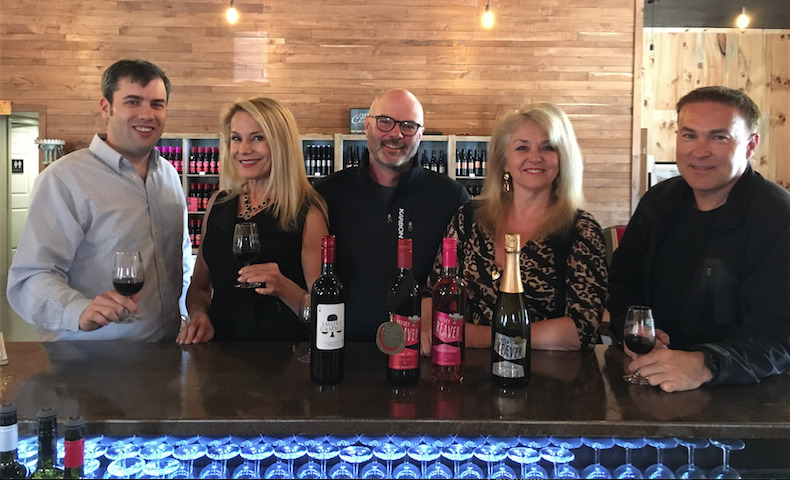 How perfect to toast Canada’s 150th birthday than with the latest winery to join this emerging wine region, that is the Frisky Beaver! On our recent visit to the area we dropped in at the winery. A super cool barn constructed with three types of wood sourced from their neighbor, previously a lumber mill. Rustic, casual and comfortable, the barn is outfitted with a massive parsons table and seating for guests to sit and sip. A glorious glass chandelier hangs from above offering a contrasting touch of elegance. At the bar one can enjoy the wine tastings and get the full scoop on the area and winery from either Brock or Ginny. Frisky Beaver came onto the scene just a couple of years ago, but has captured the hearts and pleasured the palates of many we learn. In fact the Frisky Beaver Red was awarded the DOUBLE GOLD last year at the “All Canadian Wine Championships”, a special category in which ALL judges must concur on the winner. So what’s the story? Not so steeped in deep history, but still a story of three investors with a great passion, belief and investment in this emerging wine region. They experienced a few rough breaks along the way with their initial vineyard plantings in 2013 being subjected to an “arctic air” that destroyed many of the vines, only to experience the same in 2014 and 2015! Persevering, to today, Frisky Beaver wines are made with grapes both owned by Frisky Beaver, as well as grapes sourced from approximately 15 acres of vineyards farmer owned, but winery managed. 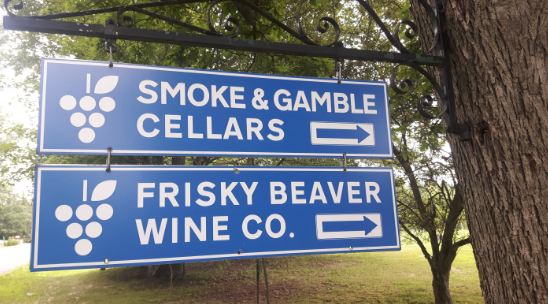 Frisky Beaver and their premium line Smoke & Gamble are produced in the quaint town of Port Dover located on the north shore of Lake Erie. Quite amazing is the success these wines have enjoyed so quickly. With catchy names, good quality and fun attractive labels they have captured the wine drinker’s attention and loyalty. Wines such as their Shades of Grey Chardonnay, Ravishing Riesling, Blushing Beaver rose and their sparkling wine Bubbly Beaver. This bubbly’s initial release saw a six month order sell through in six weeks… the wine lover is clearly responding to and embracing this latest new comer to the newest wine region! A few words on the Smoke & Gamble wines. What makes Smoke & Gamble one of Norfolk’s most exciting wines? In this case, aging is a good thing! “Time in the barrel allows for more structure, body and tannin softening the wine to form a richer, more complex flavour” says Smoke & Gamble winemaker Peter Graham. We go on to learn that the barrel aging also “brings out the pepper and blends the aromas of a newly opened cigar box with burning autumn leaves”. Smoke & Gamble… perfect! We have to say that the folks at Frisky Beaver don’t take themselves too seriously but do take their wines seriously. WANTED PINK BEAVER Someone Stole our Pet! 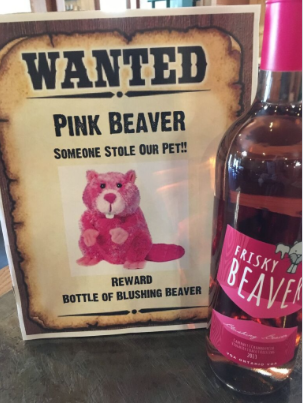 Reward Bottle of Blushing Beaver Rose. They have yet to adopt a good old Canadian beaver for photo ops, but their oversized pink mascot was stolen and they want it back! Port Dover located on the north shore of Lake Erie. The Wine Ladies at Frisky Beaver with winemaker Peter Graham. Frisky Beaver Bubbly Beaver Zesty, refreshing and balanced this sparkling wine will make for a great partner with most any summer fare. Medium bodied, crisp and dry with notes of granny smith apple, peach and lemon on the nose and on the palate, ending with a crisp finish. 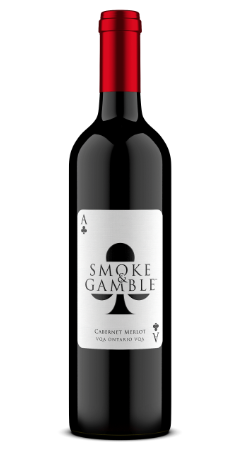 Smoke & Gamble Cabernet Merlot In this Cab Merlot, a blend of both Cabernet Franc and Cab Sauvignon, we enjoy a beautiful bouquet of “black currant and cherry wrapped around notes of subtle oak” says winemaker Peter Graham. The wine is dry, medium bodied with firm tannins, good structure and fruit forward flavours of red and black berries with a lingering finish reminiscent of subtle notes of black tea and spice. 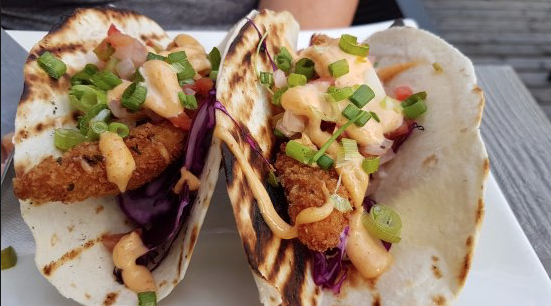 Food Pairing Port Dover is known for their perch, the 20th Annual Perch Derby takes place in early May and so when asked what would you pair with your Frisky Bubbly Beaver this summer? This was the natural pairing. Perch any way you like, pan fry, grill, bake, but make no mistake Bubbly Beaver will marry with your recipe just fine.